The Médoc peninsula is bordered by the Atlantic Ocean on its west side and the Gironde estuary to the east. For much of its history, the 50-mile estuary coastline was a vast region of salt marshes used for grazing animals rather than for growing grapes. This changed in the 17th century when Dutch merchants sought a way to provide the British wine market with an alternative to those from Graves and Portugal that dominated the market. Using technology that was advanced for that time, the Dutch were able to drain the marshland and convert much of it into viable vineyard plots. By the 19th century, the wine region of the Médoc was one of the most prosperous in France, with many wines enjoying international reputations. 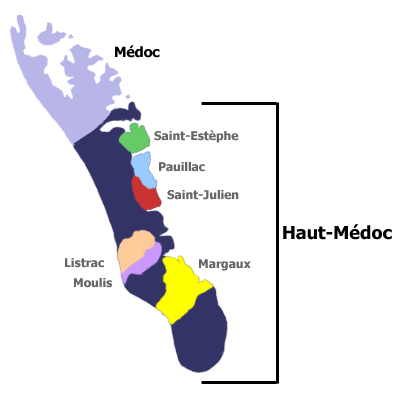 Illustration of the Haut-Medoc wine region and its sub-regions. The entire Médoc appellation runs for approximately 40 miles northwest from just outside the city of Bordeaux. 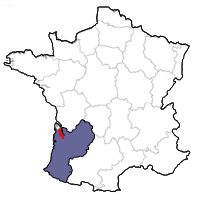 Two thirds of this area, beginning at the southern end, is classified as the sub-zone Haut-Médoc. This is the general appellation under which most wines here are released. The "big four" Bordeaux wine regions of Margaux, Saint-Julien, Pauillac, and Saint-Estèphe took shape in the wake of the Dutch engineering on the northern Médoc peninsula. Along with with Listrac and Moulis, they are part of the six prestigious sub-zones nested within the Haut-Médoc appellation. Châteaux labeled simply as Haut-Médoc rarely reaches the heights of the big four, but offer consistently good quality and excellent value. Haut-Médoc wines are usually fine but firm with generous fruit, a touch of oak and underlying minerality. Most Haut-Médoc wines are a blend of Cabernet Sauvignon, Merlot, and Cabernet Franc, although small amounts of Petit Verdot and Malbec are sometimes used. The soil in the Haut-Médoc is mainly composed of thick gravel layers that have been swept down river over time and now sit on a base of heavy clay. The warm, well-drained gravel terraces provide ideal growing conditions for the late-ripening Cabernet Sauvignon grapes that dominate plantings in the Médoc. Further inland, the soils turn to deep deposits of clay, where the Merlot grape variety thrives. Patches of limestone and sandier soils add diversity to the more widely spread gravels, which otherwise dominate the terroir.